« April is International Customer Loyalty Month. International Dance Day!. This is a day aimed at attracting attention to the art of dance celebrated by millions of dancers around the world. http://www.cid-portal.org. Get in on the act by providing dance schools and companies with uniforms for special performances as well as gym bags to carry all their wears. 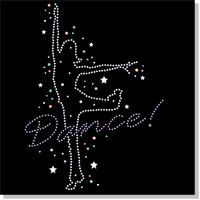 Fitness wear, rhinestone-decorated apparel is a huge hit with dancers.